Department of Pharmaceutical Chemistry 1, Department of Quality Assurance Techniques 2, S. N. D. College of Pharmacy, Yeola, Nashik - 423401, Maharashtra, India. ABSTRACT: The several spectrophotometric and HPLC methods have been reported for determination of Nebivolol and Valsartan individually or in combination with other drugs in pharmaceutical dosage forms. Hence, in the present study, a new, sensitive, suitable and cost-effective Reversed-Phase High-Performance Liquid Chromatography method was developed and validated for the determination of Nebivolol and Valsartan in bulk and tablet formulation. In RP-HPLC method, the analyte was resolved by using a gradient system, methanol and water OPA 0.1% (70:30 v/v) pH 3.5 was used as mobile phase, at a flow rate of 0.7 ml/min, on HPLC system containing UV- detector with Workstation Software and Greece C18 column (4.6 × 250 mm; 5μm). The detection was carried out at 274 nm. The retention time was found to be 5.0500 min and 9.7167 min for Nebivolol hydrochloride and Valsartan respectively. The method gave the good resolution and suitable retention time. The results of the analysis in the method were validated regarding accuracy, precision, specificity, linearity, limit of detection, limit of quantification and robustness. A simple and precise method was developed for the assay of Nebivolol and Valsartan from tablet formulation. The method does not require the use of expensive reagent and also less time consuming, it can be performed routinely in the industry for routine analysis of the marketed product of Nebivolol and Valsartan. INTRODUCTION: Valsartan is a new potent, highly selective and orally active antihypertensive drug belonging to the family of angiotensin II type I receptor antagonists. Angiotensin II receptor type I antagonists have been widely used in the treatment of hypertension, heart failure, myocardial infraction, and diabetic nephropathy. It is a lipophilic drug, and it was first developed by Novartis and has a wide market in developed and developing countries. It is available as single and in combination with other antihypertensive drugs. Valsartan is rapidly absorbed after oral administration. The volume of distribution at steady state has been estimated 17L and mean absolute bioavailability is 23%. Food decreases the exposure of Valsartan by about 40% and peak plasma concentration by about 50%. 94% - 97% of drug bound to serum protein mainly albumin. It is eliminated by non-renal route. Plasma clearance of Valsartan is 2L/h, and renal clearance is 0.62L/h 1, 2. 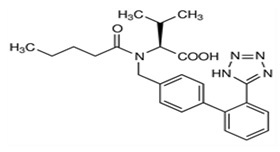 Nebivolol is a beta blocker with a unique function which distinguishes it from other beta blockers. It increases the release of nitric oxide (NO) which produces vasodilatation and thereby improves arterial compliance and reduces peripheral vascular resistance. It also reduces heart rate without improving maximal exercise tolerance. These effects are beneficial in hypertension and angina pectoris 3-10. The literature review reveals that these different dosage forms of Nebivolol hydrochloride and Valsartan are analyzed by a different method including crystal structure elution, polarimetry, UV, IR, HPLC, LCMS, and such more technique are useful in different types of analysis in the different dosage form. But now a day most important and better techniques in HPLC and GC by using HPLC simple Reverse Phase Chromatographic method develop for the determination of active content and relative impurities, while it is better to find stability indicating a method for analysis 11-20. Instruments and Apparatus: Younglin HPLC system was used for method development and validation. Data acquisition was performed on Acme 9000 HPLC with UV730 D detector (Autochrome-3000 software). The separation was achieved on Cosmosil C18 column (250 × 4.6 mm, 5 µm) column. Digital balance (Wensar high precision balance, PGB 100, sensitivity: 0.01 mg), pH meter (Unitech, ME-302), Wensar Ultra Sonicator (WUC-4L) and pipettes and volumetric flasks (Borosilicate) used during the study. Reagents and Chemicals: Nebivolol and Valsartan were purchased from Swapnroop Pharmaceuticals Pvt. Ltd. Aurangabad. The fixed dose combination product contained 5 mg Nebivolol hydrochloride, and 80 mg Valsartan was procured from the local market. HPLC grade methanol, HPLC grade water, AR grade orthophosphoric acid was procured from Merck Ltd., India. Preparation of 0.1% OPA Solution: Take 0.1 ml of OPA and transfer it into a 100 ml volumetric flask add HPLC grade water in it and dissolve them completely. Then make up the volume by remaining water to get 0.1 % v/v. The resulting solution was filtered through a 0.45μ membrane filter and sonicated for three cycles each of 10 min. Preparation of Mobile Phase (Methanol: Water with 0.1% OPA pH 3.5, 70:30 v/v): Methanol and water with 0.1% OPA pH 3.5 mixed thoroughly and degassed by sonication. Preparation of Diluent: Mobile phase was used as diluent. Preparation of Standard Stock Solution: Preparation of Nebivolol Hydrochloride Standard Stock Solution (500 µg/ml): Standard solution was prepared by dissolving 5 mg of Nebivolol hydrochloride in 10 ml methanol in clean and dry volumetric flask, add and make volume up to the mark with the distilled water and adjust pH 3.5 with 0.1% OPA. Preparation of Valsartan Standard Stock Solution (8000 µg/ml): Standard solution was prepared by dissolving 80 mg of Valsartan in 10 ml methanol in a clean and dry volumetric flask, add and make the volume up to the mark with the distilled water and adjust pH 3.5 with 0.1% OPA. Working Standard Solution of Nebivolol Hydrochloride and Valsartan (5:80 µg/ml): A 0.1 ml (standard stock solution of Nebivolol hydrochloride 500 µg/ml) and 0.1 ml of (standard stock solution of Valsartan 8000 µg/ml) were pipetted out and transferred into 10 ml volumetric flask, volume was made up to the mark with distilled water with 0.1% OPA pH 3.5 and mixed thoroughly. Preparation of Sample Stock of Nebivolol Hydrochloride and Valsartan (500:8000 µg/ml): Twenty tablets were weighed, and their average weight was determined then tablets were crushed into fine powder. Powder equivalent to 5 mg of Nebivolol hydrochloride and 80 mg of Valsartan was accurately weighed and transferred to a 10 ml volumetric flask then added 6 ml methanol and shook for 15 min and makeup volume up to the mark with diluent and mixed well then sonicate. After sonication solution was filtered through Whatman filter paper no. 42. Then 0.1 ml (sample stock solution) was pipetted out and transferred to a 10 ml volumetric flask and makeup volume up to the mark with distilled water with 0.1% OPA pH 3.5 to get a concentration of 5:80 µg/ml. Specificity: Specificity of the method can be termed as the absence of any interference at a retention time of samples. Specificity was performed by injecting blank and standard preparations. Chromatograms were recorded and retention times from sample and standard preparations were compared for identification of analytes. Linearity and Range: A series of standard solutions 5-25 µg/ml of Nebivolol and 80-400 µg/ml of Valsartan were prepared. An aliquot of 20µl of each solution was injected 3 times for each standard solutions, and peak area was observed. The plot of average peak area versus the concentration is plotted, and from this, the correlation coefficient and regression equation were generated. The calibration data of Nebivolol hydrochloride and Valsartan is given in Table 3, while Fig. 4 represents overlain Fig. 5 and 6 represent linearity graphs of both drugs respectively. Limit of Detection: It is the lowest amount of analyte in a sample that can be detected but not necessarily quantitated under the stated experimental conditions. The limit of detection (LOD) of the drugs was derived by calculating the signal to noise ratio (S/N, i.e., 3.3. Limit of detection can be calculated using the following equation as per ICH guidelines. Where, s = the standard deviation of response and S = Slope of calibration curve. Shown in Table 4. Limit of Quantification: It is the lowest concentration of an analyte in a sample that can be determined with the acceptable precision and accuracy under stated experimental conditions. The limit of quantification (LOQ) of the drugs was derived by calculating the signal to noise ratio (S/N, i.e., 10 for LOQ) using the following equation as per International Conference on Harmonization (ICH) guidelines. Where, s = the standard deviation of response and S = Slope of the calibration curve. Shown in Table 4. Method Precision: The method was validated regarding intra-day and inter-day precision. The intra-day and inter-day study were performed by injecting 10, 15 and 20 µg/ml of Nebivolol hydrochloride and 160, 240 and 360 µg/ml of Valsartan solutions three times for each aliquot. The % RSD for the precision study was found less than 2% as shown in Table 5. Accuracy (% Recovery): The recovery of an analytical method is determined by applying the method to analyze samples to which known amounts of analyte have been added. The recovery is calculated from the test results as the percentage of analyte recovered by the assay. The known amounts of standard solutions of Nebivolol hydrochloride (8, 10 and 12 µg/ml) and Valsartan (128, 160 and 192 µg/ml) were added to a pre quantified test solutions of Nebivolol hydrochloride and Valsartan (10 µg/ml) and (160 µg/ml). Each solution was injected in triplicate, and the recovery was calculated by measuring peak areas. Results are shown in Table 6. Robustness: The robustness of an analytical method is a measure of its capacity to remain unaffected by small but deliberate variations in method parameters and provides an indication of its reliability during normal usage. Robustness of the method was studied by changing flow rate (±0.1ml/min-1), mobile phase composition (±1ml/min-1) and the change in wavelength (±1ml/ min-1). After each changes sample solution was injected and system suitability parameters were observed. The results were shown in Table 7. Analysis of Combined Dosage Forms of Nebivolol Hydrochloride and Valsartan: Pharmaceutical formulation of Nebivolol hydrochloride and Valsartan in combined dosage form was purchased from local market. The response of combined dosage form was measured at 274 nm for quantification of Nebivolol hydrochloride and Valsartan by using RP-HPLC. The amount of Nebivolol hydrochloride and Valsartan present in sample solution were determined by the responses into the regression equation for Nebivolol hydrochloride and Valsartan in the method. Results are given in Table 8. The experiments mentioned above were carried out in a controlled environment during the academic year 2017-2018 at the Quality Assurance Laboratory of S. N. D. College of Pharmacy, Yeola, and Nashik, India. HPLC experimental work was carried out at Reliable Industrial Training Laboratory at Jalgaon, Maharashtra, India. RESULTS AND DISCUSSION: To optimize the RP-HPLC parameters, several mobile phase compositions were tried. 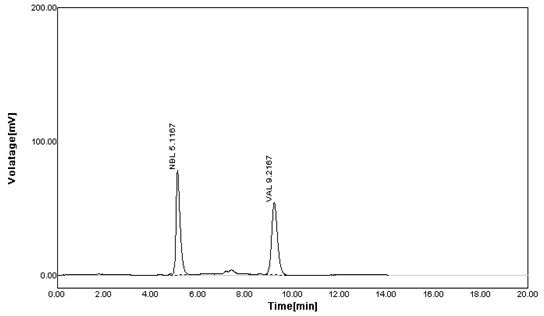 A satisfactory separation and good peak symmetry were found in a mixture of 70:30 methanol and water with pH 3.5 adjusted with 0.1% OPA and flow rate 0.7 ml/min proved to be better than the other compositions regarding resolution and peak shape. The effluent was monitored at 274 nm using a UV detector. The retention times of Nebivolol hydrochloride and Valsartan were found to be 5.0500 and 9.7167 min. respectively. A chromatogram of the mixture in optimized conditions is shown in Fig. 3 and the system suitability parameters are shown in Table 2. System Suitability Study: System suitability study shown in Table 2. Specificity: The method was found to be specific as there was no interference observed in any of the parameters under observation. Linearity and Range: The linearity of Nebivolol hydrochloride and Valsartan were found between 5-25 µg/ml and 80-400 µg/ml respectively. The results are shown in Table 3. LOD and LOQ: The LOD was found to be 0.2636 µg/ml for Nebivolol hydrochloride and 0.6996 µg/ml for Valsartan, while the LOQ was found to be 0.79 µg/ml for Nebivolol hydrochloride and 2.12 µg/ml for Valsartan shown in Table 4. Precision: The % RSD for repeatability study for Nebivolol hydrochloride and Valsartan was found to be 1.99 and 0.55 respectively. The Inter-day and Intra-day study also show % RSD value for Nebivolol hydrochloride and Valsartan within the acceptable limit. Results for precision study are shown in Table 5. Accuracy: Accuracy of the method was confirmed by recovery study at three levels (80%, 100%, and 120%) of standard addition. Percentage recovery for Nebivolol hydrochloride was found to be 100.38% to 101.58%, while for Valsartan it was found to be 99.55% to 102.27% as shown in Table 6. Robustness: The typical variations studied under this parameter were flow rate, wavelength and mobile phase composition. Overall % RSD was found to be less than 2% for all variations which indicates that the proposed method is robust. Robustness data are shown in Table 7. Analysis of Sample Tablet by Proposed Method: Applicability of the proposed method was tested by analyzing the commercially available marketed formulation. The percentage of Nebivolol hydrochloride and Valsartan were found to be 100.01% and 99.78% respectively. Results as % assay are shown in Table 8. CONCLUSION: The method provides selective quantification of Nebivolol and Valsartan This developed RP-HPLC method for estimation of Nebivolol and Valsartan is accurate, precise, robust and specific. The method has been found to be better than previously reported method, because of its, isocratic mode and use of an economical and readily available mobile phase, readily available column, UV detection and better resolution of peaks. All results were found satisfactory. So, this newly developed method can be suitable for routine analysis of combined dosage forms due to easily available reagents and which are cost effective. ACKNOWLEDGEMENT: Special acknowledge to Reliable Laboratory, Jalgaon, S. N. D. college of pharmacy, Yeola, Nashik, which provided us with the required equipment’s, chemicals needed to achieve this work. CONFLICT OF INTEREST: The authors declare there is no conflict of interest. Kumari B and Garg R: Drug profile of Valsartan: A review. World Journal of Pharmaceutical Sciences 2015; 3 (8): 1598-1606. Shirkhedkar AA: A concise review of the analytical profile of Valsartan. Eurasian Journal of Analytical Chemistry 2017; 12 (4): 337-364. Chate PU, Kalshetti MS and Patil RY: Development and Validation of HPLC method for simultaneous estimation of Valsartan and Nebivolol in the dosage International Jour of Pharmaceutical Analysis 2017; 4(4): 2395-2466. Dabhade B: Development and validation of RP- HPLC for the simultaneous estimation of Nebivolol and Valsartan in bulk and combined tablet dosage form. World Journal of Pharmaceutical Research 2017; 6(5): 1284-1310. Sivakamasundari G and Kannappanet N: Analytical methodologies for determination of Valsartan: An overview. World Journal of Pharmacy and Pharmaceutical Sciences 2017; 6(9): 605-617. 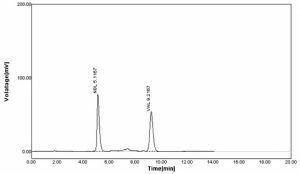 Maslarska M: A High-Performance Liquid Chromatographic method with ultraviolet detection for simultaneous analysis of three sartans (Valsartan, Irbesartan and Telmisartan) has been developed for quality control. Indian Journal of Pharmaceutical Education and Research 2017; 51(2): 343-348. Mittal A: Design of experiment based optimized RP-HPLC Method for simultaneous estimation of Amlodipine and Valsartan in bulk and tablet formulations. Austin Journal of Analytical and Pharmaceutical Chemistry 2015; 2(6): 1057. Bhavani LRD and Durgaaruna R: Method development and validation of HPLC for determination of Levetiracetam and Valsartan in their formulations. Research and reviews: Journal of Pharmaceutical Analysis 2015; 4(2): 42-56. Heli RV, Patel SS, Ladva BJ, Nayak BS, Patel SJ and Mahida VM: Development of Stability indicating HPLC Method for simultaneous estimation of Nebivolol hydrochloride and Valsartan in the tablet dosage form. World Journal of Pharmacy and Pharmaceutical Sciences 2015; 4(6): 662-670. Ola MA: HPLC- fluorescence determination of Valsartan in human volunteers and its application in bioequivalence study of two Valsartan tablets. Life Science Journal 2013; 10(2): 583-590. Madhavi C, Siddartha B and Parthiban C: Simultaneous estimation and validation of Nebivolol and Valsartan in tablet dosage form by RP-HPLC. 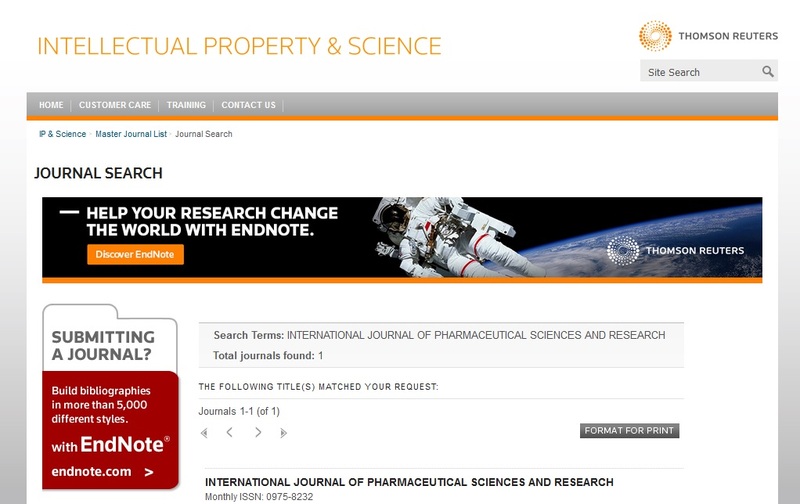 International Journal of Pharmacy and Pharmaceutical Sci 2014; 6(1): 278-281. Sastry BS, Srinivasulu D and Ramana H: Reverse Phase HPLC Method for the analysis of Nebivolol in pharmaceutical dosage forms. JPRHC 2009; 1(1): 25-33. Kumbhar ST: A validated HPTLC method for simultaneous quantification of Nebivolol and Hydrochlorothiazide in bulk and tablet formulation. 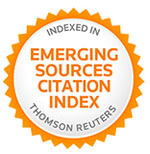 International Journal of Pharmaceutical Sciences and Drug Research 2011; 3(1): 62-66. Modiya JS: Simultaneous estimation of Nebivolol Hydrochloride and Valsartan in bulk and capsule dosage form by simultaneous equation method. International Journal of Chem Tech Research 2010; 2(3): 1387-1390. Chaudhary AB: Estimation of Valsartan and Hydrochloro-thiazide in pharmaceutical dosage forms by absorption ratio method International Journal of Applied Biology and Pharmaceutical Technology 2010; 1(2): 455-465. 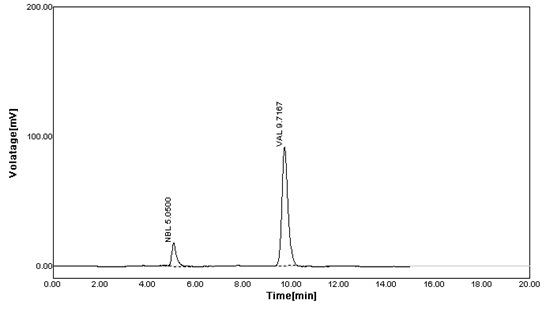 Sharma A, Patel B and Patel R: Simultaneous Estimation of Nebivolol Hydrochloride and Amlodipine besylate by High-Performance Thin Layer Chromatography. International Journal of Pharma and Bio Sciences 2010; 1(4): 339-347. 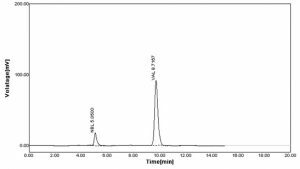 Paithankar HV: HPLC method validation for pharmaceuticals: A Review.International Journal of Universal Pharmacy and Bio Sciences 2013; 2(4): 229-240. ICH, Q2A, Text on validation of analytical Procedures International Conference on harmonization, Geneva 1994:1-5. ICH, Q2B, Validation of analytical Procedure: Methodology, International conference on Harmonization, Geneva 1996: 1-8. ICH, Q2R1, Text on validation of analytical Procedures International Conference on harmonization, Geneva 1994: 1-13. Jadhav PB and Parwe CD: RP-HPLC method development and validation for simultaneous estimation of Nebivolol and Valsartan in bulk and dosage form. Int J Pharm Sci & Res 2019; 10(2): 756-62. doi: 10.13040/IJPSR.0975-8232.10(2).756-62.